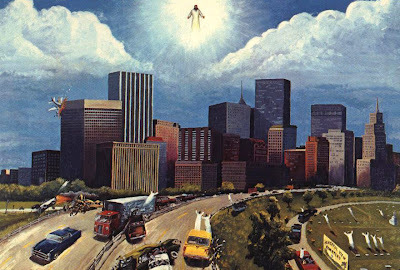 I just wanted to post this classic painting of the rapture unfolding in Dallas. I know you've seen it elsewhere, but what the hell. Click the image for a detailed view of the carnage. You have to ask yourself how many of those fatal traffic accidents could have been avoided if Jesus had chosen to make a less dramatic appearance. All part of the big cosmic plan, I guess. The only person in the image with any sense appears to be the dude on the motorcycle-- kind of hard to see at this resolution, but he's on the far left of the scene. A tip of the hat to Umberto St. John for sending the image as a postcard many years ago.